Please note that the content of this book primarily consists of articles available from Wikipedia or other free sources online. 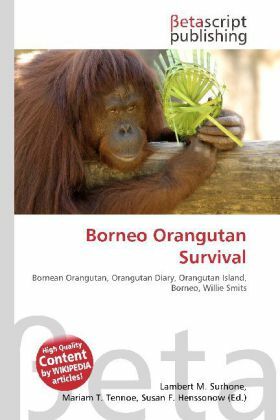 The Borneo Orangutan Survival (BOS) Foundation is an Indonesian non-profit, non-governmental, environmental organization dedicated to the conservation of Bornean Orangutans and their habitat through the involvement of local people. It is audited by a multinational auditor company and operates under the formal agreement with the Indonesian Ministry of Forest to conserve and rehabilitate orangutans. BOS manages orangutan rescue, rehabilitation and re-introduction programmes in East and Central Kalimantan. With almost 1000 orangutans to care for and over 400 staff BOS is the biggest primate conservation NGO worldwide.